EZ-TRUST Rapid HIV Home Test Kit will give the user a private, sensible, quick and accurate rapid test results in 5 minutes to ascertain if the user is infected with HIV virus. It is an aid only to identify infected individuals. *Please note that the Test Kit is an aid only to identify individual at this point of time. Doctors advise that the typical period of time between first contact and a positive test indication is about 90 days which is the "Window Period". 5 minutes for actual results. It detects for HIV Antibodies. Evaluated by International Health Boards and approved by Local Authorities and tested in labs. User-friendly (no mixing, no equipment, no medical expertise required). Easy interpretation of results (within 5 minutes). Room temperature storage (no refrigeration required). Sterilized auto-retractable lancet for single use. The user must be fully aware of the 3 months "Window Period". The "Window Period" is the time it takes for a person who has been infected with HIV to react to the virus by creating HIV antibodies. The 3 months "Window Period" is the standard guideline used by doctors when conducting the HIV test in Clinics and Hospitals. 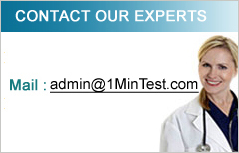 It is advisable to do 2nd testing outside the 3 months "Window Period". Why You Can Trust Our Product? Our products comply with ISO 9001 therefore the HIV Kits are reliable and safe to use. The HIV Kits are different from any other unknown China manufactured HIV / AIDS / STD Home Test Kit that you might come across online as we are fully certified and approved by major bodies. Any manufacturing errors are unlikely therefore the HIV Kits will give you very accurate and reliable results. The advantage of a HIV Home Test Kit is that you do not have to return to get your test result - results are readily available in about 5 minutes. HIV Test Kits are single-use and do not require laboratory facilities or highly trained staff. The HIV Kits are not home sampling. You DO NOT need to mail back the blood sample. The results are immediate. 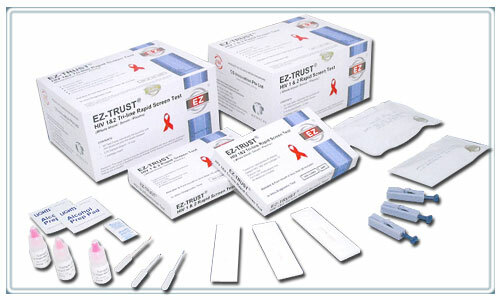 When performing the EZ-TRUST Rapid HIV Home Test Kit, the steps involved must be followed closely, If there has been a possible exposure to infected blood, and the person tested negative for HIV, the test must be repeated in 90 days. It is imperative that a positive HIV test result be followed by a Western Blot or PCR test performed by a doctor or clinic to confirm if you are indeed HIV positive. Since NO test, nor test kit is infallible, it is best to confirm test results by using a licensed medical testing facility. For one time usage only.